Dr. Chiu received his bachelor degree in Chemical Engineering from National Taiwan University of Science and Technology in 1988 and Ph.D. in Pharmaceutics and Pharmaceutical Chemistry from the University of Utah in 1994. 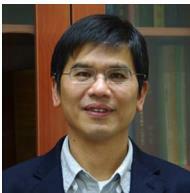 He joined the Department of Chemical Engineering of National Chung Tsing University as an associate professor in 1995 and was promoted as a full professor in 2002. He moved to the National Tsing Hua University (Taiwan) as a full professor in the Department of Biomedical Engineering and Environmental Sciences in 2009.